The natural shedding of baby teeth follows the progressive resorption of the roots by cells resembling osteoclasts (Cells that functions in the breakdown and resorption of bone tissue). This physiological resorption may be an inherent developmental process or it may be related to pressure from the permanent successor against the overlying bone or tooth. Microscopic areas of superficial (surface) resorption of the roots of permanent teeth are common but are transient and are repaired by the apposition of cementum or of a bone-like tissue. Such microscopic foci are of no clinical consequence. In contrast, dental resorption sufficient to be diagnosed through x-rays is always pathological (of disease origin). Pathological resorption may start from the root surface (external resorption) or from the pulpal surface (internal resorption). What are the types of tooth resorption? Resorption of tooth is the process of removal of dental hard tissues by bone cells called osteoclasts. There is usually some forms of repair, either by reactionary dentine or bone, and repair may lead to ankylosis (abnormal fusion to bone). All resorption is identical in its basic process, but it is convenient to subdivide resorption into clinically relevant types. Resorption may be classified as inflammatory or replacement types, or alternatively as internal or external types. All types may be transient (short-lived) or progressive. External resorption may be caused by inflammation and by pressure or mechanical stimulation or be of unknown (idiopathic) cause. 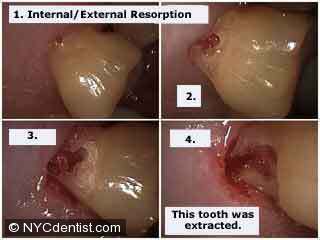 External resorption starts on the surface of the tooth, usually on the root. A microscopic degree of superficial external root resorption is normal and is usually repaired by cementum. Greater resorption at the tip of the tooth (apical) may be seen through x-rays on teeth that have been moved by orthodontic means. 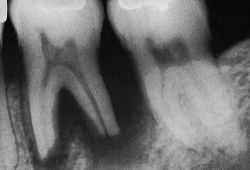 Extensive apical resorption may accompany inflammation around the root tip or infection on non-vital teeth. A non-vital pulp may also trigger external resorption of the root towards the crown by producing toxic products which diffuse outwards to the periodontal ligament along the dentinal tubules. Resorption at the neck of the tooth (cervical) usually starts just below the gum margin and may affect one or many teeth. 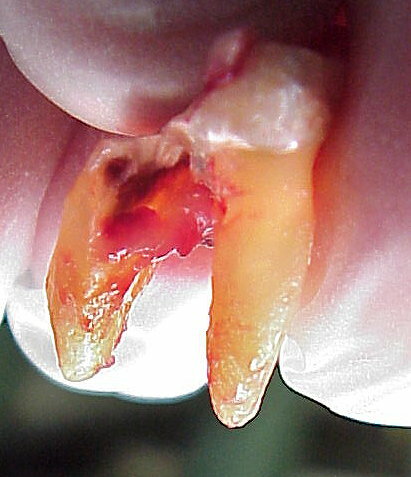 External resorption of the crowns of impacted teeth is uncommon. The enamel is normally separated from the surrounding connective tissues by the reduced enamel epithelium, which appears to confer protection. If the epithelium is lost, in total or part, a burrowing type of external resorption may follow. Again, calcified repair tissue resembling cementum and/or bone may be formed and ankylosis may result. All types of external resorption are irregular in outline and extensive lesions often spare a thin layer of dentine around the pulp so that the pulp can remain vital until a late stage, even if the defect communicates with a gum pocket. Inflammatory resorption is associated with detectable inflammation and may be internal or external (apical or cervical). Inflammatory resorption typically involves the apical portion of the root, as a result of periapical inflammation following pulp death or trauma. Inflammation may be evident through x-rays or clinically as redness. Inflammation may also play a role in pressure or mechanical root resorption and in the burrowing type of external resorption involving the neck areas of the teeth. The inflammatory type of resorption has the positive aspect that treatment of the cause of the inflammation may halt the resorption. Unfortunately this is not entirely predictable. Many cases of so-called inflammatory resorption, both internal and external, are not associated with significant inflammation clinically or histologically and are perhaps better regarded as idiopathic. Replacement resorption is resorption accompanied by progressive replacement of the tooth by bone. It is often associated with ankylosis and is a complication of luxation (tooth displacement) injuries, particularly intrusion (tooth pushed into socket) and avulsion (total displacement), as well as re-implantation or transplantation of teeth. Inflammation is absent, so that treatment, which is difficult, must be directed at the resorption itself. A burrowing type of resorption is most commonly seen. A localized area of the root surface is first resorbed, following which the resorption burrows deeply into and ramifies throughout the dentine, producing a labyrinthine network of lacunae and channels. The resorbed tissue is replaced by granulation tissue in which varying amounts of calcified repair tissue and/or bone may form and ankylosis may result. The pulp remain vital unless exposed by the resorptive process or fracture of the residual dentine shell. This type of resorption usually starts in the neck region of the tooth and it has been suggested that trauma to the cementum may trigger the process. It is likely that inflammation plays a role. This entry was posted in Oral Care and tagged dental resorption, external resorption, external tooth resorption, internal resorption, internal tooth resorption, resorption of tooth, root resorption, tooth resorption, tooth resorption causes on June 17, 2012 by oileng.